Everyone meets the problem of keeping laundry in one place. Some of us just throw our things on the floor or all over the place, especially after a hard day at work when we come home tired and want nothing more than to take a shower and have a dinner, least of all sort our laundry. However, dirty clothes thrown all around the house do not look attractive at all. Such a habit is not the healthiest one, either, as sweaty shirts and socks have the tendency to hoard bacteria and scatter odors. Yuck! A simple and affordable solution will help you eliminate the piles of laundry – a laundry hamper. Lightweight yet durable, they are a perfect choice for storing your clothes until you are ready to wash them. Apart from the hampers, other products can help you make laundering your clothes more comfortable. Laundry baskets can be used for organizing your laundry, as well as for carrying your clothes. Laundry bags will protect your delicate garments during washes. Look through our pointers and reviews to find out some tips on how often to launder your clothes and choose the best laundry hamper, basket, and bag for you. What is the Difference between Laundry Baskets and Hampers? The main difference between these two products is their initial purpose. Hampers are used as containers for your dirty clothes where you can store them until you wash them. Baskets are used to carry dirty clothes to the washing machine or the laundry room, wet clothes to the dryer or the line outside, and dry clean clothes back home from the laundry. 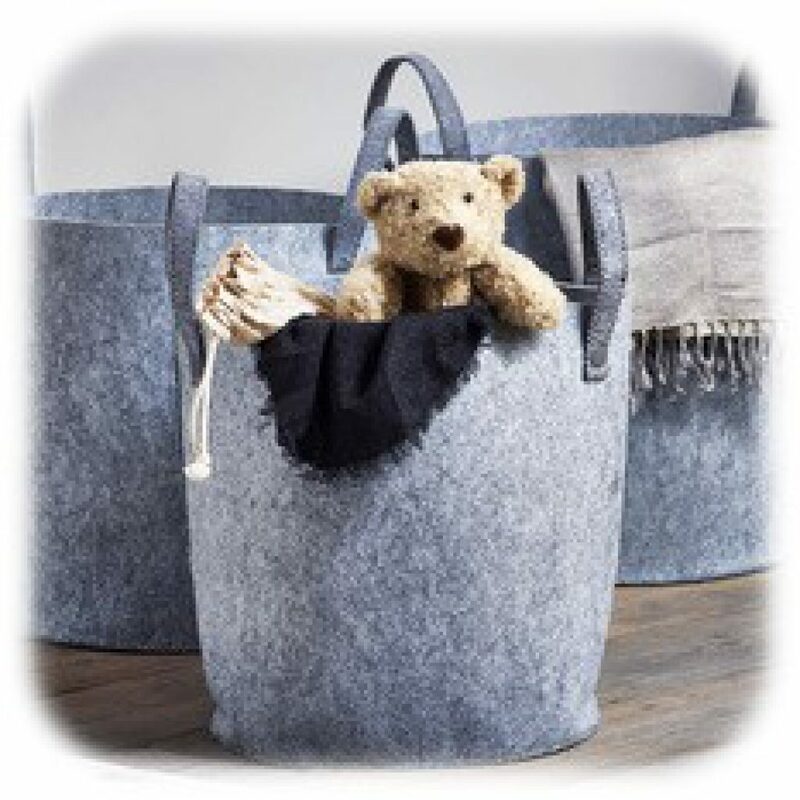 However, modern laundry hampers often come with handles for carrying, and laundry baskets are often used as a place where dirty clothes sit waiting to be washed. Another distinct feature that sets these products apart is their design. Hampers are usually tall and come with a cover or lid. They are collapsible and can be folded to take up as little space as possible when you do not need them. Baskets are short and open, usually wider at the top than at the bottom, although there are square models, too. Laundry baskets come with built-in handles, usually two, for gripping. The material these products are made of is also different. The design of most hampers comprises a flexible wire frame and a fabric body, usually made of breathing canvas or polyester mesh to create good airflow. 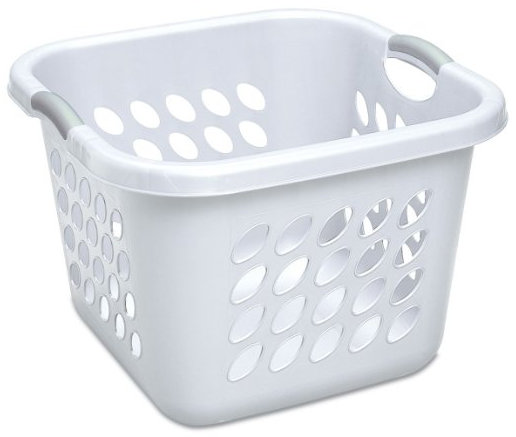 Laundry baskets are made of durable plastic, thick and sturdy. Washing your clothes often enough is vital not just for your health, but for the health of everyone around you. According to BBC, human bodies shed about five hundred million skin cells and a liter of sweat a day. They contain the Staphylococcus epidermidis bacteria, part of the normal human skin flora, which can cause different diseases and persistent infections. 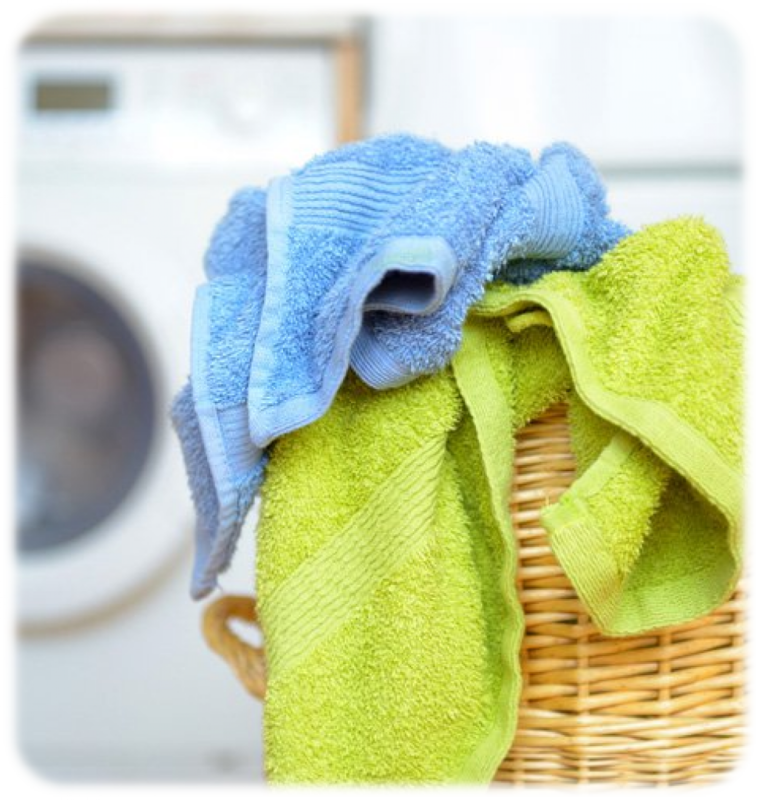 Apart from sweat and skin cells, your laundry can contain different kinds of dirt, allergens, and feces. That is why it is essential to wash your clothes often enough to prevent any health issues. However, you should not go to extremes, either. Washing your clothes too often is not productive, either, especially from the environmental viewpoint. According to Home Water Works, up to 40% of an average four-person family’s water consumption is spent on washing laundry. Most washing machines use over 40 gallons of water to wash an average-size laundry load. Today, there are water-saving washing machines that use half as much water, although, even they are not of much help when it comes to conserving water. Apart from the water, washing machines consume a lot of energy. Shirts – one day if you have been sweating profusely; two days if you have not. Merino wool socks – three uses. Cotton socks – one wearing. This is one of the most popular models available on the market today. It is a great option for those who like simplistic designs and natural materials. Its neutral style will look great in any décor. You can place it in a bathroom, a closet, or any other place that works best for you. With the dimensions of 23 x 14 x 14 inches, the hamper is capacious enough to hold your clothes, bed linens, bath towels, and bathrobes. 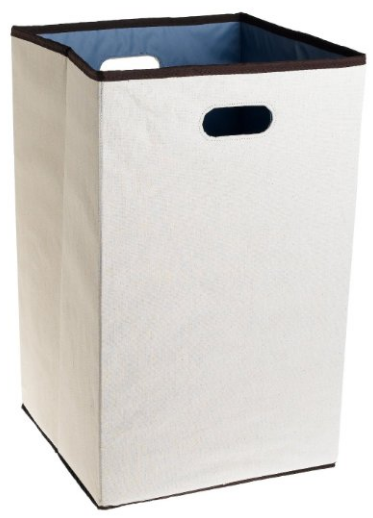 Made of thick canvas, this laundry hamper from Rubbermaid combines practicality and beauty. Such choice of material makes the hamper durable and easy to clean. It comes with a stain-resistant lining on the inside so that you can put your muddy work or sports clothes in it without worries. Thanks to its foldable design, the hamper is easy to store virtually anywhere. It becomes flat when folded and can fit behind doors or anywhere comfortable. This lightweight hamper is a real lifesaver for those who have a large family and a lot of weekly laundry. Lightweight and portable, it weighs just 1.7 pounds. Its dimensions are 16 x 16 x 25 inches. The hamper comes with two handles so that you can carry it to the washing machine without effort. This model is available in two finish colors, black and charcoal. 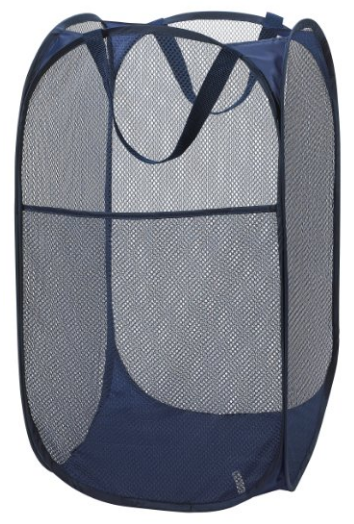 The ergonomic design of this laundry hamper from Household Essentials comprises a mesh body and a spring wire frame. Thanks to the heavy-duty polyester mesh that provides constant air circulation inside the hamper, your laundry will be free of odor caused by sweat and dampness. The spring wire frame makes this model easy to collapse and store. The bottom of the hamper is made of solid polyester, thick and durable. This affordable hamper will be a nice choice for those who want to get a high-quality product for a low price. It has a light frame and a mesh body. The frame is flexible and can be twisted and folded for easy storage. At the same time, it is sturdy enough to hold a full hamper of clothes. The breathable mesh fabric will eliminate moisture and bad smells. 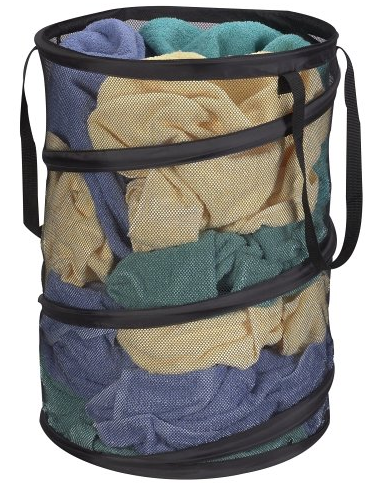 This laundry hamper from Handy Laundry is just the thing for dorm students, owners of small apartments, and other people who have to carry their dirty clothes to laundry rooms. It has two carrying handles and a roomy side pocket where you can store detergents and fabric softeners. This model comes in several finish colors including black, navy blue, red, and white, so that everyone can find a model to their liking. 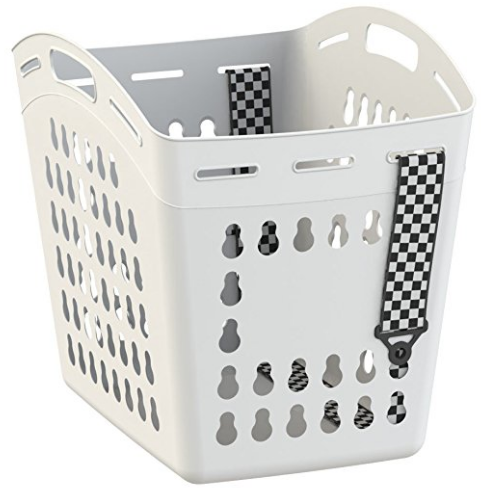 This laundry basket will make carrying heavy loads of laundry easier than ever. Its sturdy and durable construction with reinforced rims and ergonomic handles ensure comfort and practicality of use. The handles have an easy-grip color-accented surface for the utmost convenience. The unit comes with a modern design and is available in just one color, white. The Ultra laundry basket from Sterilite is made of thick plastic. Its surface is easy to clean. The sides of the basket come with vents to provide air circulation and keep the laundry odorless. A compact design with square shape and high walls allows the unit to take up as little space as possible. The size of the basket is 19 x 19 x 13.9 inches and its capacity is 1.5 bushel. This model is available as a separate basket, as well as in sets of 8, 10, and 12. 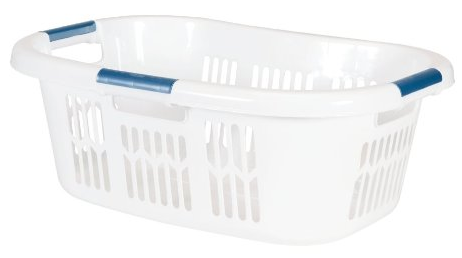 This plastic basket will make laundering your clothes much easier. One of its sides has a curved design that allows resting it on a hip for one-handed carrying. Unlike most laundry baskets that come with two handles, this model features three ergonomic grab-through handles. Such a construction makes lifting and carrying the basket much easier. You can purchase one separate basket, as well as a set of two and four. The Hip Hugger laundry basket from Rubbermaid is large enough to hold up to seven full-size bath towels, folded and stacked tight. Its dimensions are 25.8 x 18 x 9.5 inches and its weight is 2.3 pounds. It comes with a smooth finish to protect your delicate clothes from damage. The color of the basket is white, and the color of the handles is blue. The manufacturer provides a lifetime warranty on this product if you keep the receipts and all the original stickers. The design of this laundry tote comprises a basket and a shoulder strap. The basket comes with two handles for holding. At the same time, the strap allows carrying your laundry hands-free. The strap is secured to the basket with the help of a keyhole lock and can be adjusted to meet your unique needs and match your height and build, whether you are tall or short, big or small. Made of soft and flexible yet durable resin, this laundry tote from United Solutions is very pleasant to the touch. The hands-free hanging option will be especially useful for people with back and joint pain. The strap must be inserted through slots for extra stability. Two sides of the tote have write-on labels so that everyone can sign their personal laundry basket. This set of laundry bags is a great thing for laundering lingerie and delicates. Made of premium-quality silky mesh fabric, they will protect your clothes and keep them looking new even after numerous washes. Apart from being strong and durable, the bags are smooth to the touch and give you a luxurious feel. The set includes three white bags and one black, allowing you to keep light and dark colors separate. 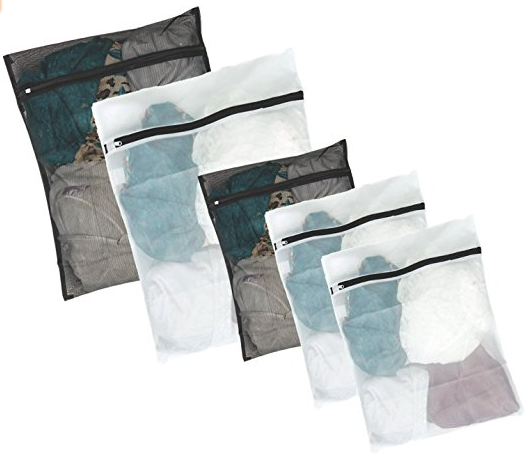 This set of laundry wash bags from InsideSmart will help you prolong the life of your most delicate garments: lingerie, hosiery, intimates, and more. There are two large – 12 x 15 inches – and two medium – 16 x 19 inches – bags in the set. They come with rustproof zippers under zipper guard. The manufacturer offers a “Smart-Wash” guarantee and promises to give your money back if your clothes accidentally get damaged during a wash. This set includes five bags – one 24 x 24-inch black jumbo bag, two extra-large 20 x 16-inch white bags, and two medium 15 x 12-inch white bags. Each of the white bags come with a zipper of a different color – green, orange, blue, and pink. These bags can be used both in the washing machine and in the dryer. They are guaranteed to offer a perfect performance and protect your delicate clothes during each wash.
Made of high-quality polyester, these laundry bags from Bagail are tough and durable. The mesh fabric makes them light and breathable. Each bag comes with a rustproof zipper under a smart zipper guard to make sure that your clothes are safe. Such a design also makes washing quiet and makes sure that the washing machine is not damaged. This is another great set of wash bags. Made of soft yet durable mesh fabric, they will protect your clothes during washes and ensure that they get clean, as they do not prevent soapy water from getting inside the bag. With this set, your delicates will not get stretched, tangled, or otherwise damaged. Besides, the problem of lost socks will be solved forever. 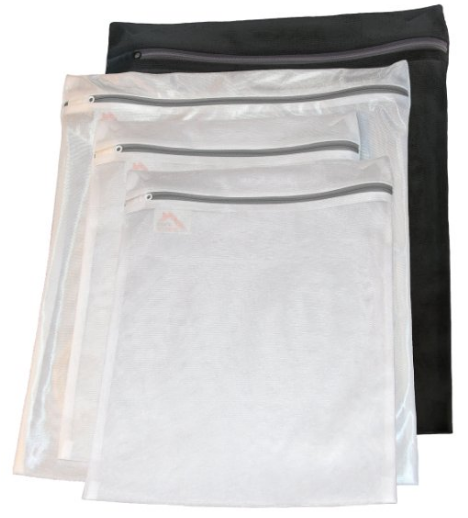 This set of mesh wash bags from Kassa includes two 16 x 19-inch jumbo bags – one white and one black – and three 12 x 15-inch bags – two white and one black. They come with plastic zippers to offer safe and quiet washing. 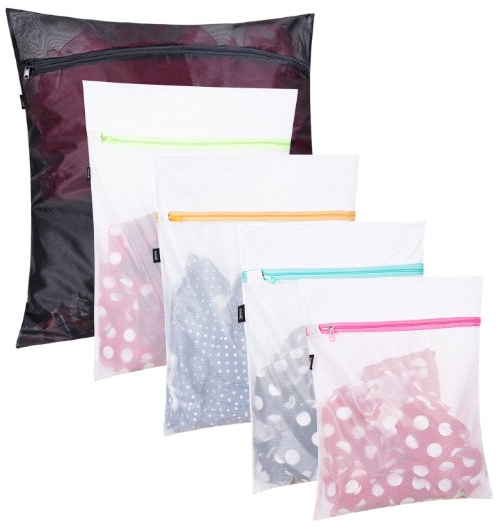 These bags are perfect for washing bras as they ensure that you will not have any tangled straps or broken underwire. Apart from the delicates, these bags can be used for washing hats and toys.